The new catering option will initially be tested at Munich Airport for six months starting on 5 September. 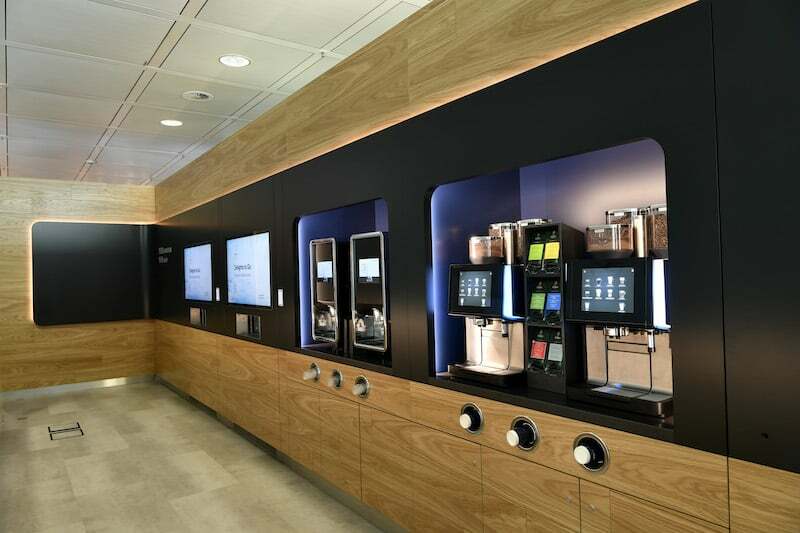 Centrally located in Terminal 2 near Gate G19, Lufthansa passengers with lounge access can now enjoy high-quality snacks and drinks in a nicely designed self-service area. This offer is free and can be accessed with the customer’s boarding pass at the entrance of the area. By operating a modern, interactive user interface, the guest can select one of three connoisseur boxes from the categories listed on the screen. The categories include Classic (main component, for example, a tuna wrap or Greek salad), Balance (for example a sprout sandwich with pear and fig mustard or a quinoa ginger salad) or Local (for example Munich sausage salad). These components are complemented by a sweet or savory snack, a piece of fresh fruit and a small bottle of water. The offer varies every two weeks. Once the category is selected, the box, an attractive, robust cardboard box, slides into the ergonomically placed output compartment directly under the monitor. Directly next to it the guest has the choice between a coffee specialty, tea, water and a variety of juices. Once the drink is selected, the cup can be put into a built-in placeholder in the box, the entire meal packed into a paper bag and the passengers can rush to the departure gate. Lufthansa developed this new quick refreshment option after conducting a field test for quick refreshment at a Frankfurt Senator Lounge. The results showed that many lounge guests in a hurry wanted an efficient, time-saving catering option in the form of a to-go offer. If you have more time, you can of course also continue visiting one of the many Lufthansa lounges at Munich Airport.